Creative problem solving requires creative problem solving activities. Because even if you know all of the problem solving steps, it’s important to know exercises and techniques to actually execute each phase. Listed below are 20 interactive exercises that will help you through each step of the problem solving process. Note: For the sake of demonstration, we’re going to use the same example for each exercise, in this case, the difficult problem of opening a jar of peanut butter (to make a delicious peanut butter and jelly sandwich of course). #1. Newspaper Headline – Try writing your problem as if it were a headline in a newspaper. You can write it as if the problem still exists, or as if the problem were already solved. Try Tabloid headlines for even more creative ideas. #2. Future Party – Imagine it’s one year from today; what did you solve in the last year? How is the world different based on the solution? What were the steps you took to solve the problem? #3. 40-20-10-5 – Explain your problem in up to 40 words. Then cut it down to 20 words; then to 10, then finally to only 5 words. These 5 words are the root of your problem (and likely the root of your solution as well). #4. Explain Life I’m Five – Explain your problem as if you were talking to a 5-year old kid. Use basic language and simple metaphors if necessary. Inspired by the subreddit ELI5. #5. Ad Game – Have people mill about the room. When someone offers up an idea, everyone emphatically says “Yes!” and then the group continues to generate ideas, often building off the last idea that was just offered. #6. Dumbest Idea First – Hold a contest to get the dumbest idea out first. Encourage everyone to think of the absolute dumbest possible solutions to the problem. After you have a long list, go back through and see which ones may not be all that dumb. #7. What Would X Do – Pretend you’re someone famous (or someone you admire) and ask yourself how they would solve the problem, what options would they consider? #8. 10x10x10 Matrix – Generate a list of 10 ideas for solving the problem. Pick one of those ideas and generate 10 variations of that idea. Pick one idea from the new list and generate 10 more variations. –Round 1 (based on tools)–Dynamite, Power Drill, Vise grip, Scissors, Hammer. –Round 2 (based on vise grip)–Metal clamp, Pliers, Glue, Cement, Sticky Glove. –Round 3 (based on sticky glove)–Lots of tapping, Rubbing the seal, Punching, Soft caresses, Really strong hand. *Note: Some of the exercises may not produce the perfect solution, but they can get you thinking differently. #9. Futures Wheel – Pick a possible solution and write it in the center of a piece of paper. List possible direct results/consequences of the solution around the center idea. List possible indirect results/consequences based on the direct results/consequences. Find more info here. #10. Thiagi’s 35 – Use a point system to determine the preferred solution among your team, turning a possibly subjective discussion into an objective group decision. You can find a more detailed explanation on Thiagi’s site. Example: Really strong hand – 7pts. Punching the jar – 3pts. A soft caress – 1pts. #11. Idea Trial – When you can’t get agreement on which solution to choose, have the proponents of each idea represent them in “court.” Go through opening arguments, call witnesses and allow closing statements. Have the project board choose the winner. #12. Coin-Flip – When deciding between two equally good solutions, flip a coin. When the coin is in the air, take note of what you secretly hope the result is and go with that (if you really can’t decide between the two, then go with the actual result of the coin-flip). Inspired by this poster. Example: Heads is strong hands, tails is a soft cares. *Toss. * (I really don’t want to have to caress this jar of peanut butter…) Strong hands it is! #13. End in Mind – To create your plan, start with the end in mind and work backwards. Establish key milestones and dates in reverse order, starting with the end-of-project celebration and ending with today. #14. Idea Mock-ups – Create a mock-up of the solution. You can a create physical mock-up using the various supplies in your office or a virtual mock-up using images from around the web. Example: Tell me you wouldn’t buy this incredible product. #15. Gamification – Turn the completion of your project into a game. Establish rules for how you earn points, create badges to celebrate milestones and track game progress. Learn more about gamification. Example: For each squeeze of the PB Gripper, you get 1 point. 100 points earns you the Gripper Badge, 500 points earns you a pudding cup. After 1,000 points you should be able to open the Peanut Butter jar. #16. Be a Character – Add some fun to your work by executing your plan as if you were a fictional character. Think about how they would operate and get into character. Example: (as the Incredible Hulk): HULK SMASH! #17. Apply McLuhan – Answer McLuhan’s tetrad of questions in context of your solution: 1) What does your solution enhance? 2) What does it make obsolete? 3) What does it bring back that was once obsolete and 4) What does it flip into when taken to the extreme? 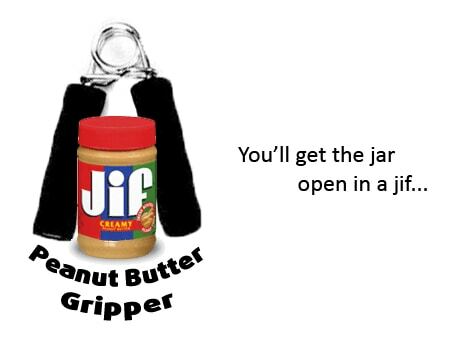 Example: Using a strong grip to open the jar: 1) The ability to get peanut butter, 2) Other tools for opening jars, 3) The joy of cooking my own food, 4) Only eating peanut butter and nothing else. #18. Word on the Street – Conduct “word-on-the-street” type interviews with members of your team, asking them how they felt about the project and the solution. #19. Stop-Start-Continue – Review the way you completed your project and pick activities you should stop (things you did on this project that you don’t think are necessary for future projects), start (things you didn’t do on this project but that you should do on future projects) and continue (things you did on the project that you should do on future projects). Example: STOP doing every single exercise for one solution. START finding snacks to eat while waiting to get to the solution. CONTINUE eating peanut butter. #20. 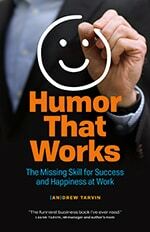 Find the Funny – Write a monologue or stand-up set that covers some of the funny moments or ideas from the project. Share it with your team. Example: What’s the deal with airline peanut butter? Note: The example used may be a bit facetious but these exercises do work for tougher problems. I wanted to include an example to facilitate understanding and it happened to be around snack time. can I use this for my class?